To say I'm excited about this holiday season might be an understatement. But as I look around on some of my favorite blogs, I feel a little behind. I have trimmed exactly zero trees, whipped up no fabulous holiday recipes, not hung a single shiny ball. And it has nothing to do with a moral imperative about waiting until after Thanksgiving or even not feeling the holiday spirit - I have no good excuse. I have to remind myself it's only November and I'm just fine. Phew. I'm going to get a jump on some of my holiday DIY projects this weekend. I'm sure I'll feel a lot better about it then. Until then, I'll have to rest easy on the laurels of my projects of Christmas past. This list is adorable! I feel like it deserves its own check box. I am way behind, as well; I normally have the trees and house decorated by the first weekend in November. No excuse but laziness! Perhaps I need an adorable list to motivate me! Did you make that kraft roll holder? Tutorial please!!! Maybe you feel behind, but when you DO do it, you do it so well. I can't wait to see what you come up with. And by the way, we haven't done a darn thing either. What's the rush?!? This is my son's account - sorry. Please don't do elf on the shelf. I hate that thing. LOL!!!!!! Having never actually done Elf on the Shelf, I don't really understand why people get so worked up about it. It seems fun to me but its easy enough to skip - why the warning? Awesome list! And this kraft roll holder is very cool! Did you make it yourself? I'm waiting to see your projects. I'm sure it will be great !! Add to your list: write to Santa's elves in France, Norway, Finland and Canada. Sadly, I don't read French. What happens when you write to the French, Canadian and Scandinavian elves? 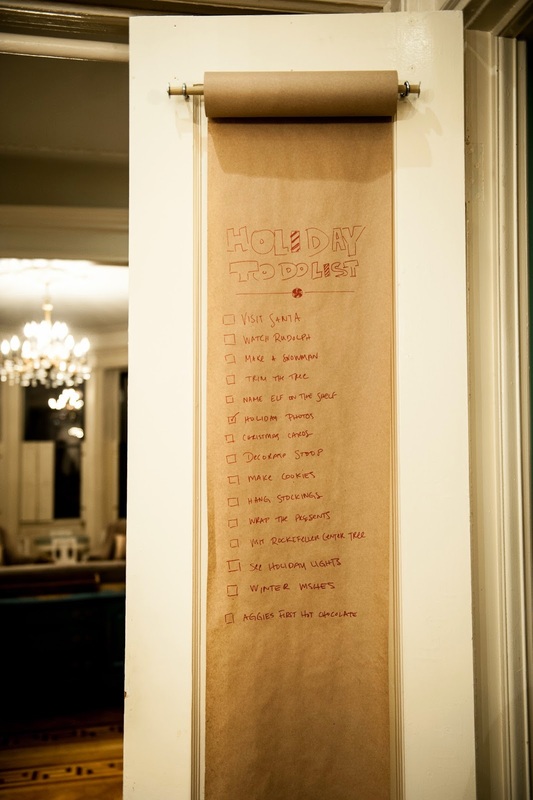 I love that kraft paper rolls. IMHO, it's a must if you have a kid. It makes fun sounds, it's light and big, it can be torn and smashed and drawn and built of.. endless possibilities. I think you are setting yourself up with the Elf on the Shelf. Fortunately for you A is young so if you don't feel it this year she won't expect it next year.